the Most Outstanding Academic and Extra-curricular Awards. Blackville School held their Recognition Awards Ceremony on Monday, June 6. Grade 12 student Ashlyn Moody and grade 10 student Daniel Richard received the Most Outstanding Academic and Extra-curricular Awards. Grade 12 student Brook Underhill received the Fenton Sturgeon Memorial Award which is awarded to a grade 12 student who has been involved in sports for all four years of high school. Special consideration can also be given to students who have volunteered their time coaching younger athletes outside school hours. High School Male Athlete of the Year went to Grade 12 student Dylan Storey and High School Female Athlete of the Year went to grade 12 student Ashlyn Moody. The Kathy McCormack Award, recognizing athletes who are great school ambassadors, went to grade 12 student Josh Underhill. 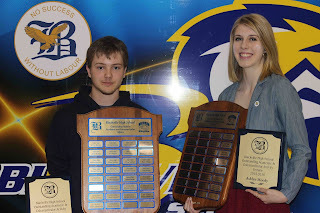 Middle School Male Athlete of the Year went to grade 8 student Drake Donovan and Middle School Female Athlete of the Year went to grade 8 student Hayley Underhill. Grade 11 student Robyn Stewart received the School Spirit Award. For more photos from the awards ceremony, click here.